We begin with various gauges of sheet copper, copper tubing, and copper wire. We cut the desired shape out of the copper sheet, and grind the edges smooth. Next is the hammering process. Usually this is where most of the real work happens. The different pieces are hammer-formed into strong 3-D shapes, using a wide variey of self made anvils and many other custom-made tools. The hammering and shaping process gives my sculptures their beautiful and organic textures. These pieces may look delicate, however they are very sturdy and designed for a lifetime of enjoyment. Once the individual pieces for a sculpture have been cut and shaped we use a variety of welding and mostly brazing techniques to permanently join the pieces into their final form. Then each piece has been reinforced to strengthen the sculpture for indoor and outdoor use. After final assembly and quality assurance checks have been finished the sculpture is ready to go to the paint booth! 1.) Each piece is polished, cleaned, and readied for paint work. 2.) We then paint each piece using a bamboo brush and an assortment of acid patinas to bring out the natural blue, green and black patinas of weathered verdigris copper. Our process allows us to control the natural aging of the metal resulting in just the right amount…once each piece is finished, we then spray a clear-coat finish over it so it will not age or patina further! 3.) Most pieces are then airbrushed using translucent paints directly over the top of the shiny copper surface. The results of this paint technique is nothing short of amazing. The luminescence of the final finish is second only to the finish, after we spray a double wet-coat of urethane on top. This top coat has all the UV inhibitors in it, for outdoor sun protection. The thickness of the additional ultra-clear clear-coat gives each piece a very bright luminescence that is so striking especially outdoors in the sun. 4.) As the final step, each piece is put into an oven and baked. 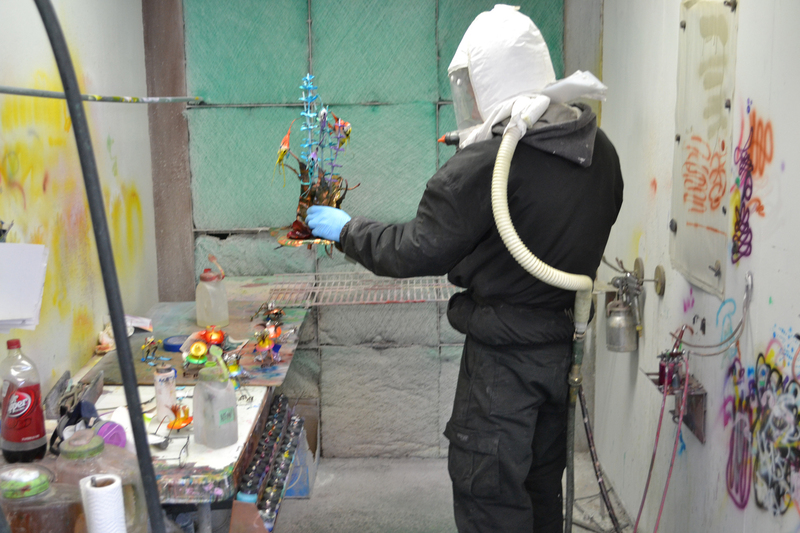 The oven baking process fully cures the urethane, protecting your sculpture from age, weather, sunlight & oxidation.